Ray Goldbach, along with his wife, Marie, started Marathon Cheese Corporation in Marathon City, Wisconsin in 1952. For 45 years until his death in 1997, Ray Goldbach guided the company that would become the nation’s largest independent packager of natural cheese. He also founded Packaging Tape, Inc and owned several other businesses. Ray Goldbach was born in Marathon in 1921. He began working at a local cheese company while still in high school and worked there fulltime until the outbreak of World War Two. After serving four years for the U.S. Army in the South Pacific, Goldbach returned to Marathon, married Marie and moved to Manitowoc where he worked for the Pauly Cheese Company. After being transferred to Green Bay, Ray Goldbach and Marie studied and experimented with the idea of individually wrapped portions of cheese. In 1952, the Goldbachs launched Marathon Cheese Corporation, buying block cheese from local processors and cutting, packaging and selling it in consumer sizes to local supermarkets. Pauly Cheese was its first customer. After a number of setbacks, the new business began to expand…and then flourish. By 1956, Marathon was packaging for most major cheese companies. Marathon Cheese Corporation has grown to four plants and has been recognized in Fortune Magazine as one of the 500 largest independently owned companies in the United States. 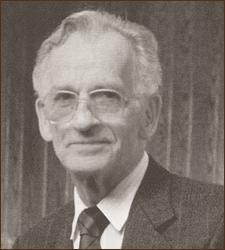 Over the years, Ray Goldbach was credited with many industry innovations, including the packaging of shredded cheese, the first one-pound midget longhorns, the first easy-open package for cheese and the cutting of consumer portions into various shapes and random sizes from blocks of cheese weighing more than 600 pounds. Ray Goldbach also was cited in Fortune Magazine in 1991 as “setting the fastest pace in cheese packaging.” He received the prestigious National Cheese Institute Laureate Award in 1992 for dedication and service to the cheese industry and was recognized as a “true trailblazer in the cheese industry whose creative ideas will have an impact on the industry for years to come.” Goldbach also founded Packaging Tape, Inc., a distributor of various packaging, janitorial and safety supplies and equipment. It’s still doing business today. In addition, he purchased and operated Timber Ridge Country Club in Minocqua from 1987-1997 and was a former owner of the Landmark Hotel in Wausau. Ray and Marie Goldbach were honored as 1985 “People of the Year” by the Marathon City Business Association. The Goldbachs donated funds in 1988 to build an indoor swim center in Marathon City. The Goldbach Foundation continues annually to support the swim center’s on-going operating expenses. Since opening, an average of more than 1,000 children a year have taken swim lessons free of charge. The Goldbachs have created scholarship programs for local high school students, including a scholarship program for children of Marathon Cheese and Packaging Tape employees. Raymond Goldbach died on September 26, 1997. His legacy and legend live on in the lives of his companies’ employees and his lifelong hometown. The North Central District of Junior Achievement is proud to honor Raymond A. Goldbach as a 2010 Champion of Business.